Ah, summer. A time to enjoy rising temps, open water, live music, the outdoors, and of course – an ice cold beverage. Summer can be an oxymoron too, a time when you naturally want your life to slow, so it can be fully savored while at the same time, your calendar fills up quickly. That’s because it’s this time of year, and there’s a revitalization of socialness. We as humans crave adventure. Splurging, relaxing. Being in the presence of each other. No matter what your summer looks like, it will look better with Miller Lite and Miller High Life. We’ll make sure of it! We have a busy summer ahead, too, with giveaways and summer promos for our very best fans. At Bernick’s we’re big on our communities, and that includes our social community and legion of fans. That’s why we’re offering you a chance to win tickets to Luke Bryan’s Kick Up the Dust tour this summer! 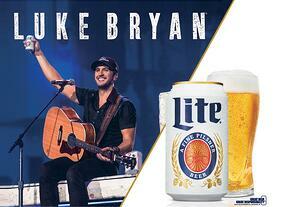 To enter, show us your Miller Lite love by submitting a photo of your #MillerTimeMN for a chance to win a four-pack of tickets and one-night hotel stay when Luke’s tour stops in Minnesota on Saturday, June 20th at TCF Bank Stadium. Luke Bryan was just named 2015’s Academy of Country Music Entertainer of the Year, and together with Miller Lite - the beer that invented the light beer category - you can bet this will be a summer night you won’t soon forget. If you haven’t already, go “Like” our Bernick’s page on Facebook, as we’ll be collecting submissions and announcing the winner there June 1st. It’s Miller Time when you’re grilling, taking in town team baseball games, and watching parades march past your home. But, because we’re mighty Minnesotans, and the (beer) glass is always full, it’s also Miller Time when you’re weeding the garden, mending fences, and literally watching paint dry. Miller Lite makes everything better, even the mundane, mindless tasks everyone has to partake in. Each time you tip a cold Miller Lite back this summer, make sure you include the #ItsMillerTimeMN hashtag. We want to see every single way you make Miller Lite your own! You can text to win with Miller Lite’s summer promo by entering the code from each Miller Lite product you purchase this summer. Show us your Miller Time, and we’ll show you how being a loyal fan can pay off! Minnesota takes its fishing season like it takes it’s beer – seriously. And for good reason. From the time the ice-outs begin in the spring to the fishing opener in May, the countdown to one of our state’s favorite pastime painstakingly begins! Miller High Life helps pass the time until you can get your boat in the water and the bait on the hook. There’s a whole lot of tradition that goes into making Miller High Life and the same can be said for fishing the lakes of this state. Visit www.krugerfarms.com for your chance to win a ‘Sweet Stick’ fishing rod and a Miller High Life Fishing Jersey. For more inside ticks, trips, and contests sign up for our monthly eNewsletter!